Many maps are static two-dimensional, geometrically accurate representations of three-dimensional space, while others are dynamic or interactive, even three-dimensional. Although most commonly used to depict geography, maps may represent any space, real or imagined, without regard to context or scale; e.g. Brain mapping, DNA mapping, and extraterrestrial mapping. Cartography, or map-making is the study, and often practice of crafting representations of the Earth upon a flat surface (see History of cartography), and one who makes maps is called a cartographer. In addition to location information maps may also be used to portray contour lines (isolines) indicating constant values of elevation,topography, temperature, rainfall etc. Maps from non-Western traditions are oriented a variety of ways. Old maps of Edo show the Japanese imperial palace as the "top", but also at the centre, of the map. Labels on the map are oriented in such a way that you cannot read them properly unless you put the imperial palace above your head. Medieval European T and O maps such as the Hereford Mappa Mundi were centred on Jerusalem with East at the top. Indeed, prior to the reintroduction of Ptolemy's Geography to Europe around 1400, there was no single convention in the West. Portolan charts, for example, are oriented to the shores they describe. Polar map of the Arctic or Antarctic regions are conventionally centred on the pole, and the concept of orientation does not apply; the direction North would be towards or away from the centre of the map, respectively. Reversed maps, also known as Upside-Down maps or South-Up maps, reverse the "North is up" convention and have South at the top. Many, but not all, maps are drawn to a scale, expressed as a ratio such as 1:10,000, meaning that 1 of any unit of measurement on the map corresponds exactly, or approximately, to 10,000 of that same unit on the ground. The scale statement may be taken as exact when the region mapped is small enough for the curvature of the Earth to be neglected, for example in a town planner's city map. Over larger regions where the curvature cannot be ignored we must use map projections from the curved surface of the Earth (sphere or ellipsoid) to the plane. The impossibility of flattening the sphere to the plane implies that no map projection can have constant scale: on most projections the best we can achieve is accurate scale on one or two lines (not necessarily straight) on the projection. Thus for map projections we must introduce the concept of point scale, which is a function of position, and strive to keep its variation within narrow bounds. Although the scale statement is nominal it is usually accurate enough for all but the most precise of measurements. Large scale maps, say 1:10,000, cover relatively small regions in great detail and small scale maps, say 1:10,000,000, cover large regions such as nations, continents and the whole globe. The large/small terminology arose from the practice of writing scales as numerical fractions: 1/10000 is larger than 1/10000000. There is no exact dividing line between large and small but 1/100000 might well be considered as a medium scale. 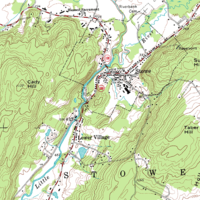 Examples of large scale maps are the 1:25000 maps produced for hikers; on the other hand maps intended for motorists at 1:250,000 or 1:1,000,000 are small scale. It is important to recognize that even the most accurate maps sacrifice a certain amount of accuracy in scale to deliver a greater visual usefulness to its user. For example the width of roads and small streams are exaggerated when they are too narrow to be shown on the map at true scale; that is, on a printed map they would be narrower than could be perceived by the naked eye. The same applies to computer maps where the smallest unit is the pixel. A narrow stream say must be shown to have the width of a pixel even if at the map scale it would be a small fraction of the pixel width. Sometimes the scale of a map is distorted deliberately. For example the map of Europe shown here has been distorted to show population distributions. Clearly the basic scale is approximately uniform for the rough shape of the continent is still visible. This is an example of a cartogram. Another example of distorted scale is the famous London Underground map. The basic geographical structure is respected but the tube lines (and the River Thames) are smoothed to clarify the relationships between stations. Near the centre of the map stations are spaced out more than near the edges of map. Further inaccuracies may be deliberate. For example cartographers may simply omit military installations or remove features solely in order to enhance the clarity of the map. For example, a road map may or may not show railroads, smaller waterways or other prominent non-road objects, and even if it does, it may show them less clearly (e.g. dashed or dotted lines/outlines) than the highways. Known as decluttering, the practice makes the subject matter that the user is interested in easier to read, usually without sacrificing overall accuracy. Software-based maps often allow the user to toggle decluttering between ON, OFF and AUTO as needed. In AUTO the degree of decluttering is adjusted as the user changes the scale being displayed. Azimuthal or Gnomonic map projections are often used in planning air routes due to their ability to represent great circles as straight lines. From the last quarter of the 20th century, the indispensable tool of the cartographer has been the computer. Much of cartography, especially at the data-gathering survey level, has been subsumed by Geographic Information Systems (GIS). The functionality of maps has been greatly advanced by technology simplifying the superimposition of spatially located variables onto existing geographical maps. Having local information such as rainfall level, distribution of wildlife, or demographic data integrated within the map allows more efficient analysis and better decision making. In the pre-electronic age such superimposition of data led Dr. John Snow to discover the cause of cholera. Today, it is used by agencies of the human kind, as diverse as wildlife conservationists and militaries around the world. See also: Webpage , PDF , MapQuest, Google Maps, Google Earth, OpenStreetMap or Yahoo! Maps. The various features shown on a map are represented by conventional signs or symbols. For example, colors can be used to indicate a classification of roads. These signs are usually explained in the margin of the map, or on a separately published characteristic sheet. Maps exist of the solar system, and other cosmological features such as star maps. In addition maps of other bodies such as the Moon and other planets are technically not geological maps. Many diagrams such as Gantt charts display logical relationships between items, and do not display spatial relationships at all. Many maps are topological in nature, and the distances are completely unimportant, and only the connectivity is significant. Freeman, Herbert, Automated Cartographic Text Placement. White paper. Ahn, J. and Freeman, H., “A program for automatic name placement,” Proc. AUTO-CARTO 6, Ottawa, 1983. 444-455. Freeman, H., “Computer Name Placement,” ch. 29, in Geographical Information Systems, 1, D.J. Maguire, M.F. Goodchild, and D.W. Rhind, John Wiley, New York, 1991, 449-460. O'Connor, J.J. and E.F. Robertson, The History of Cartography. Scotland : St. Andrews University, 2002. Geography and Maps, an Illustrated Guide, by the staff of the U.S. Library of Congress .